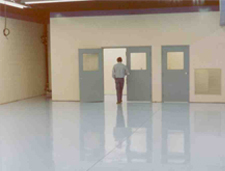 A & B System 5000 is a very effective coating in meeting the demands associated with industrial flooring applications. Examples: stamping plants, automotive plants, warehouses and most manufacturing facilities. Coverage 300-325 sq. ft. per gallon, (roller or brush) recommended 3-5 mils wet. Clear and any standard color. Seals concrete, prolongs life, attractive, improves cleanability, high abrasion resistance, and resists most chemicals.